Ian Lynn Palmer is a singer song/writer from Newport, South Wales. His music is Americana Country Folk with a hint of blues, yet always remaining punk at heart. 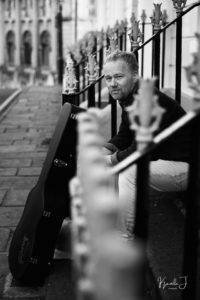 A self taught musician playing guitar, harmonica, banjo and ukulele, writing songs about his life experiences and observations led Ian to becoming noticed and being nominated for Best Original Song and Best Male artist at the “Love Live Music” Awards 2017. Taking his influences from Bruce Springsteen, Bob Dylan, Johnny Cash, Neil Young in August 2017 Ian Lynn Palmer released his first EP, The Last Goodbye, which has been played on numerous radio stations to much acclaim. Ian is currently working on his second EP, to be released sometime in 2019.